A complete kit containing all the parts needed for a 35mm Lean to roof kit. 35mm polycarbonate is used in high end conservatories because of its excellent heat and sound insulation performance. Our 35mm polycarbonate sheets have 7 chambers for optimum strength and our heavy duty glazing bars are specifically designed to accommodate the larger thickness. Choice of white or brown roofs with clear, bronze or opal polycarbonate as standard. 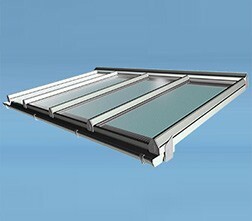 Heatguard Opal and Bronze Opal polycarbonate is also available as an upgrade, please call the office for details. Please note: The projection is the roof bar length not the horizontal measurement across the ground. 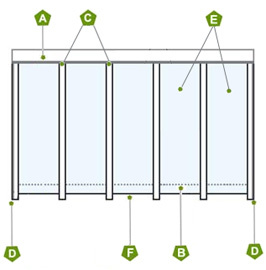 All 35mm lean to roof kits include a Wall Plate (A) and an Eaves Beam (B) PVC capped self support glazing bars (C) including two dedicated end bars (D), cut to size polycarbonate sheets (E) and PVC sheet closures for the ends of the sheets (F). Rainwater goods are not included. If you need a size that is not listed please call us on 01536 446395 as we can make one to suit. All roof kits include a Wall Plate, an Eaves Beam (or Ring Beam), Glazing Bars and Polycarbonate sheets cut to size to match the roof kit of your choice. In addition the roof kit includes F sections to cloak of the ends of the roof and to protect the front edge of the polycarbonate sheet. Buying a lean to roof kit from the Canopy Shop gives you peace of mind as all our kits are professionally manufactured and meet current building regulations. We offer a range of lengths and projections that can reach spans of up to 5m. If there is a size that is not listed please call us on 01536 446395.